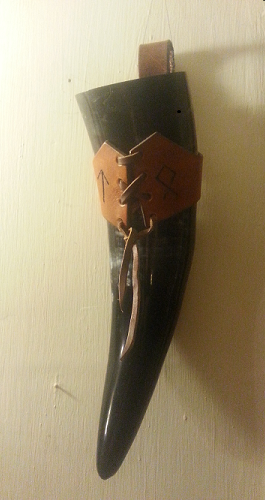 These meadhorns are beautifully marked and every one is unique. They are highly polished outside and the finish includes treatment inside using a taste-free coating which makes them great vessels for receiving either ale or mead. They hold about 1 pint and measure roughly 10-11"( 25-28 cms). No two are the same. The leather holsters are designed to hang on a belt (or wall) and have Tiw and Edel runes (Defend The Ancestral Land) branded onto them.